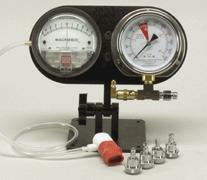 Additional information The Scuba Tools Dual Pro Stand instrument package provides a side by side display of the Magnehelic and IP gauge in a versatile mounting base. This system is the next best thing to the A.I.R. Flow Analyzer and will test all critical regulator functions except flow. This Dual Pro Stand includes the Dwyer Magnehelic with dual scale 0-3 H20/0-7.62 CM WC calibration gauge and the 4" Scuba Tools IP gauge with dual scale 0-300 psi/0-20 bar and is rated at ±1% accuracy for the full swing. The IP gauge is protected by a pressure relief valve pre set @ 275 psi, and the input port will fit all standard low pressure regulator hoses. The unit is shipped fully assembled and includes The Scuba Tools mouthpiece adapter and all four custom SpinOns. The Pro Stand can be used free standing or fastened to any vertical or horizontal flat surface.